PLDT's Chairman and CEO Manny V. Pangilinan delivers a stellar speech for the Contact Center Association of the Philippines for the launch of its iBelong Membership Card. The speech, delivered last October, is published exclusively on HOT JOE. It’s not often that Filipinos are able to say that they’re one of the world’s best at something. We usually reserve such claim in domains where our excellence is acknowledged—our hospitality, boxing, maybe even basketball, and of course, the IT-BPM sector. For about two decades, the contact center industry has grown to employ about 800,000 FTEs. Much of that is due to the people in this hall, and to the values and talent that allow Filipinos to excel in your industry. 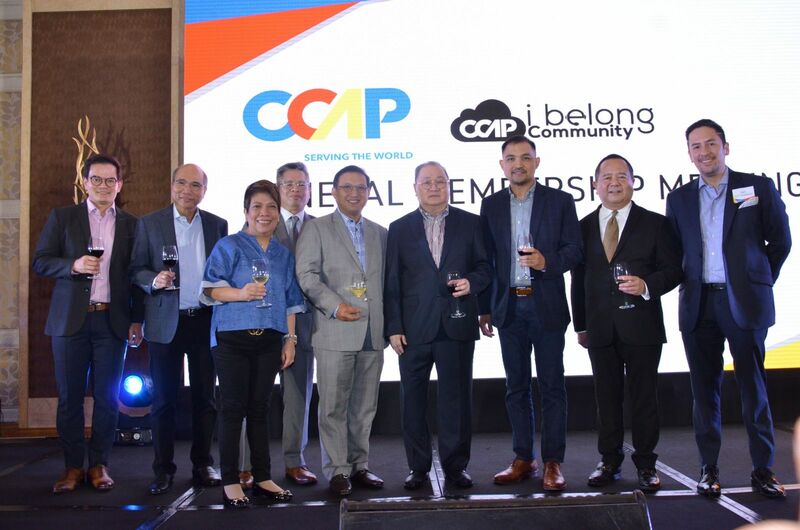 CCAP’s sterling work over these years has given tangible expression to the Filipino values your organization evokes: sikap at malasakit. Yes, it is time to celebrate the Filipino worker. We all know how OFW remittances have kept our economy’s legs running over so many years. These remittances are like IV fluids—a direct injection of money into the economic bloodstream, thereby raising consumption expenditures in our GDP. What’s more: The cost to produce these remittances—setting aside the investment the country has made to feed and educate our OFWs before they migrated—is practically zero. Each year, OFW remittances send home about 30 billion dollars through formal channels. In addition, about 10% of that is coursed through informal padalas. For its part, the contact center industry registers around $14 billion in revenue inflows annually. Taken together, this industry is the single largest business in the country today, and probably its most productive in terms of value added to the economy. But you have to be always mindful of your marginal cost to produce, because possibly higher margins elsewhere in Asia would be adverse to the industry. Also, the prospective uncertainty on your incentives—especially income tax holidays—is an important cost factor to consider moving forward. Lately, however, there have been concerns in your industry about technology—with the fear that it could obsolete the industry as it exists today. The prominent technopreneur, abinash tripathy, referred to this as the industry’s “MODEL T” moment—referencing the automobiles of Henry Ford produced with the first-ever moving assembly line, and displacing the horse and carriage trade. The fact is that the tide of technology has already washed on your shores. For example, chatbots and artificial intelligence are already disrupting your industry. AI is promising to make machines more intelligent, by building capabilities for them to learn, and build more useful knowledge. In addition to AI, we see millions of people spend part of their day on the net interacting with chatbots, which have become their social companions. AI makes it possible to develop bots endowed not only with IQs but also with companion EQs. This allows engaging, non-judgmental and anonymous conversations to happen. Yet despite all efforts to infuse machines with the human qualities of emotion and empathy, I cannot believe that robots can replace interaction between humans—the tenderness and warmth of, say, a mother’s hug, or a wife’s embrace. Not to mention the simple joy and laughter from sharing jokes amongst friends—iba yun, talaga. Talking to a robot is simply that—talking to a robot. Finally, cyber security has become a subject of attention, given the wave of tech frauds happening globally, including hacked customer databases, stolen identities, credit card and remittance frauds—increasing the pressure on contact center companies to develop robust security platforms and firewalls, as well as personnel trained on cyber security and data privacy. The challenges are formidable, but the prospects are not altogether bleak. Satya Nadella, the Microsoft CEO, noted in his book titled “Hit Refresh” that the human skills in creativity, as well as the human judgment and accountability for his decisions, are irreplaceable. The whole point of creativity, he wrote, is “to keep searching.” Even tons of analysis made by machines cannot replace human judgment, and the responsibility that flows from human decisions. These aspects of humanity guarantee that people cannot be completely replaced. However, to remain relevant, you have to level up with the digital trends happening with your customers. New and more sophisticated services—in the fields of finance, health services, education, and cyber security—require higher forms of knowledge and skills from your industry. Additionally, customer service requirements have also become more demanding. They want intelligent and instantaneous interaction. They want real-time, quick, and empathetic answers to their questions, and solutions to their issues. Therein lies a new suite of opportunities: better core customer experience achieved through intuitive, flexible design; through machine learning auto-suggestions and personalization; through automated chatbots; and through more intelligent search. Let’s look back to the “MODEL T.” The reality is that it did displace some workers, and it disrupted the industry. But the model T had a positive effect on the human side of the equation. It allowed workers to innovate on more valuable work. With innovations, workers were able to upgrade their skills and receive better pay. He has formed the hospital’s own cyber academy, to retrain affected hospital staff to acquire digital skills. Similarly, I understand the broader IT industry here is in discussion with government for a P40 billion, 5-year IT skills upgrade program. We should support this, because a vibrant IT indistry would be a great competitive differentiator in the region. It is important that the IT industry achieve its goals in 2022—about 2 million direct hires, 7.6 million indirect employment, 500,000 jobs outside NCR, $40 billion in revenues, and a 15 percent share of the global IT-BPM market. Even tons of analysis made by machines cannot replace human judgment, and the responsibility that flows from human decisions. These aspects of humanity guarantee that people cannot be completely replaced. However, to remain relevant, you have to level up with the digital trends happening with your customers. We’re here today to introduce iBelong, a membership engagement platform that unlocks an unprecedented level of communication, collaboration, and synergy amongst CCAP members and their employees. Employees can track their performance on iBelong. They can redeem rewards, and access a wealth of online learning courses and certifications. The iBelong membership card, powered by PayMaya, empowers them with a cashless wallet, through which they can make purchases, transfer funds, and earn points. Employers, on the other hand, gain a powerful management and communications tool. They can more effectively track and reward employee performance, influence company culture, make decisions based on solid data, and nurture happier employees who can grow to be true ambassadors of the brand. iBelong sends a resounding message to employees—that they are not alone; that they belong; that our respective “i”s are part of a strong, collective “we”; that even in a technologically advanced world, they will not be left behind. "iBelong sends a resounding message to employees—that they are not alone; that they belong; that our respective “i”s are part of a strong, collective “we”; that even in a technologically advanced world, they will not be left behind." In the context of your theme today, the proper question to ask must be: How can we harness technology to solve our country’s biggest challenges—poverty, economic inequality, health, jobs, and education? Most importantly, how can we provide more jobs, including those which automation may displace? In reflecting on the meaning of technology, I cannot help but ask these existential questions: Why are we here? Where did we come from? What are the planet earth and the universe all about? Intrigued by these basic questions, I looked and found a way to get some insights. I came upon astrophysics—which talks about the single atom big bang happening 14 billion years ago, describes how the universe has evolved since, and speculates on how it might end. Will the universe ultimately explode because dark energy is accelerating its expansion? Or will dark energy or gravity compress the cosmos into a single atom as in the big bang? How Earth was formed out of stardust 4 billion years ago, into a ball of fire. How matter, including water from outer space was brought to earth by meteors, which eventually created life; and the first life came from a simple single-celled aquatic organism, which evolved to where we are today. It tells us that human beings are made of matter from space. All this knowledge, and more—the unfolding of the universe from primordial particles and the development of life—fuses science and technology with our humanity, and provides a glimpse to the existential answers we seek. Science can enrich life, if we’re open to it. Finally, my hope is—one day—when our country would have embraced technology, we may look back at this day as the beginning of a movement that didn’t just assure the prosperity of your industry, but also deepened our relationship with technology, and lifted the welfare of our people. We can then say with pride—we did not wait for the future to happen; instead, we led this nation that much closer to a better tomorrow. Thank you once again, and a pleasant evening to all.